East Fife went down 2-0 to St Johnstone. East Fife head into their new league campaign on the back of a 2-0 defeat to a strong St Johnstone side. But this pre-season friendly will have done nothing to dent the confidence the side picked up in their 3-2 midweek win over Elgin City. That was a competitive game which actually meant something, Saturday's encounter at Bayview had every component of a pre-season friendly, with a long list of trialists and mass changes from the bench. The Fife team had five trialists as Darren Young aims to add to his squad ahead of kick off. Greg Hurst and Liam Gordon, both St Johnstone players, were part of the Fife starting XI with Young pondering loan moves for the pair. Scott Linton, formerly of Clyde, stepped in at left back while Kieran Duffie, who spent part of last season with the Fifers, played in the centre of the defence. It's unlikely Duffie will be returning for a second spell at Bayiew, with Young confirming after the match that the former Falkirk defender is looking for full time offers. With Thomas Cordery injured, the Fifers also offered a run out to trialist 'keeper Ryan Cowser. Saints have been back in action for a while as they prepared for their crack at the Europa League. And they looked like a side ready for league action as they stepped on the gas from the first whistle. 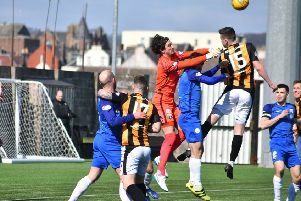 East Fife had to defend deep, like they have a few times now in the early part of the season, as their visitors pressed. Liam Craig thought he had opened the scoring for Tommy Wright's men but he was flagged offside. A second sight at goal came when Ryan Goodfellow got his body behind a Joe Shaughnessy header. The opener wasn't long in arriving and it wasn't a great surprise it went to the Saints. Graham Cummins did well on the by-line and his cut back was nodded home by Stefan Scougall. East Fife should have been level before the break when Hurst's ball across the six yard box fell perfectly for Paul Willis. The Fife midfielder wasted the opportunity and scooped his strike over the bar. Saints won the match early in the second half when Craig Thomson turned provider for David Wotherspoon to finish. “It was a worthwhile exercise. “We had a few half chances and kept our shape well. “St Johnstone are a good side who are regularly up in the top five.